With Reece tucked into the sleeping bag every night by 7:30pm last week while we were away, I found myself filling the evening hours with knitting and reading, two things I love to do. I finished up another Milo and started working on Milo number six, this one extra special because it is for my little man. It will be a Christmas present and will definitely take a little longer than the little baby ones to knit up. I also took a little go at using double pointed needles and knitted up a little bowl and then felted it. To say I am pleased with the results is an understatement, I love it. I will knit up a few more of these for the holiday season to be filled with homemade goodies - soap, body butter and lip balm, for friends. On the reading front, I am sticking with some required reading for my doula training right now with The Birth Partner by Penny Simkin. It is a great book and will be a wonderful resource for me as I embark on my doula journey. 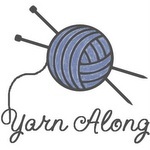 Linking up with Ginny at Small Things for Yarn Along. It is really great, and will be a great resource. Doula training is going very well, first birth coming up beginning of October. Thanks Renee. Glad you enjoyed reading about our little adventure. They do have the Art of Mentoring camps worldwide, so definitely look into it. Love seeing you whip up those milos. And I especially love that I have one of your sweet, soft creations here. Can't wait to dress that baby in it! Right now I'm soaking up the La Leche League book, "The Motherly Art of Breastfeeding" to stock up on knowledge in preparation for my little ones arrival and have been knitting a couple little hats and thinking about starting a new blanket because my last one was a bit of a bust. I'm so inspired by your frequent knitting and projects. That bowl is wonderful and I love your idea of using it to fill with other gifts as well. Such a wonderful book. I have to reread it for my doula training soon. Little knitted baby hats are the best, I think I am going to knit up one for my first doula client...I think she would love it. so many milo's being knit. the colorways you are picking are so lovely. The bowl is too cool. Do you have a pattern for it? Thanks KC. It is actually a pattern from the lovely Amanda Soule in her book Rhythm of the Family (in the month of March). Super easy and really quick to knit up. That bowl is so great! I know Reece will love his Milo, because his Mama made it for him! I love that pattern! I have a feeling there will be many of those in my future. Good for you for already working about Christmas presents. I've been thinking about mine? It is such an awesome patter, I really love it and think I will be making one for every new baby that comes into my life. It is a pretty exciting journey and I am enjoying every minute of it. My first birth is coming up soon.